The Crystal range of thermally efficient PVC-U/aluminium bi-fold doors (WarmCore) can dramatically transform a property - our flexible systems opens up a world of possibility! Modern living is about creating spaces that works for the homeowner - gone are the days of rigidly defined spaces. WarmCore folding sliding doors were born from this ethos, and their flexibility helps your home become a space that works for you. Open and airy on beautiful summer days, warm and insulating in the colder months. WarmCore doors help integrate outside living space with interiors, enhancing both. Truly transformative, WarmCore doors will help breathe life and light into your next project. The innovative design of WarmCore folding sliding doors enables the door sashes to be split in whichever way suits your installation. The sashes can fold from right to left, or split in any other combination - a popular configuration is to have a single door at one end, called a traffic door. In addition certain door configurations offer even more practicality, as the door sashes that meet in the middle, or at one end, can be used as a set of French doors. Available in multiple combinations and colours - WarmCore bi-fold doors are perfect for those looking for contemporary styling. 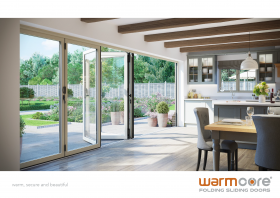 Download the WarmCore Door retail brochure below or visit the download page where you can download a huge range of brochures and technical guides. Crystal offers a range of colour options and all of these choices are available in dual colour specification. All colours shown below are a guide. Before making your final decision please ensure you have seen a sample.